A kite flying through the air is a good example of this principle. 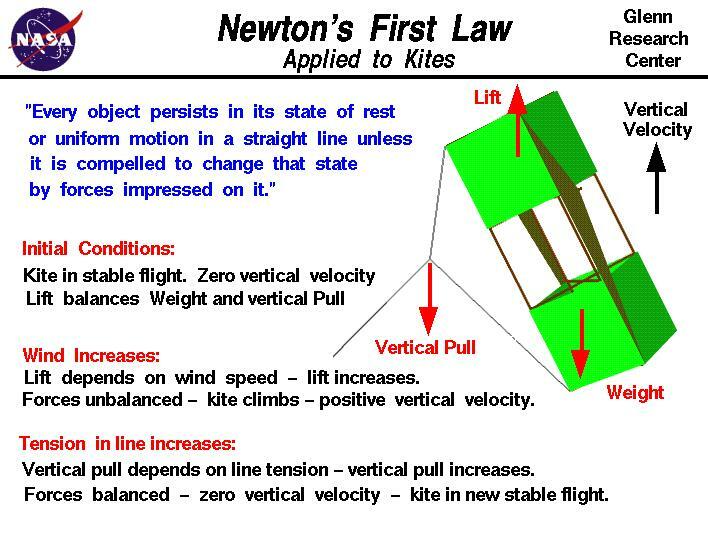 The forces acting on a kite in flight include the weight, the aerodynamic lift and drag, and the tension in the control line. In stable flight, these forces are all balanced and the kite holds a fixed altitude. The vertical velocity of the kite is zero. If the wind increases slightly, the lift and drag increase because the aerodynamic forces depend on the square of the velocity. The forces on the kite are no longer balanced and there is a net vertical force on the kite. The kite moves vertically because the lift now exceeds the weight and the vertical component of the tension in the control line. As the kite climbs, the tension force increases because of increased lift and drag. The tension force is a vector quantity and we can resolve the force into a horizontal and a vertical pull. As the tension force increases, the vertical pull increases. Eventually a new balance point is established in which the lift balances the weight and the vertical pull. The kite then achieves a new stable flight condition at a slightly higher altitude. If the wind decreases, the lift, drag, and vertical pull all are decreased and the kite achieves a new stable flight condition at a lower altitude.